The second Master Class in the seminar series on healthcare management, conducted by GMU’s newly launched College of Healthcare Management and Economics in association with the University of Central Florida will be held at the University campus on Saturday, the 16th of February 2019. 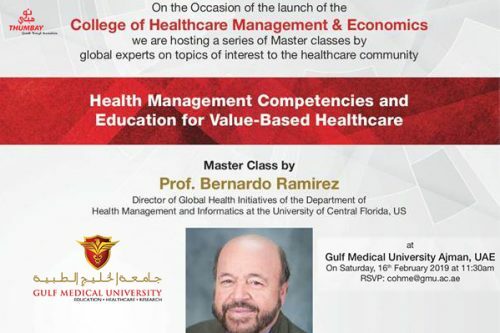 The seminar, titled ‘Health Management Competencies and Education for Value-Based Healthcare’ will be led by Prof. Bernardo Ramirez, Director of Global Health Initiatives of the Department of Health Management and Informatics, University of Central Florida. The seminar is important in view of the tremendous changes in demography, new technology, innovation in clinical practice and the regulatory environment taking place in the global healthcare sector, making the management of hospitals a highly complex and specialized task. The concept of value-based healthcare is increasingly a driving force in health systems across the world. Healthcare organizations today are seeking innovative solutions to improve performance, control costs, and most importantly to produce value for patients and healthcare professionals. Health Management educational programs have been emerging to identify the key competencies needed to meet these challenges. The Master Class will discuss the most significant competencies that affect the implementation of value-based strategies, and training methodologies to achieve related learning outcomes. Conducted free of charges for participants, the series of seminars is expected to bring to the UAE, the most up-to-date practices in healthcare management, hospital management, health economics, finance etc. Participants will have their queries answered by the experts and seek career advices. The first Master Class in the series was conducted at Le Meridian, Dubai, on the 11th of February 2019, themed ‘New Challenges for Clinicians and Managers’, presented by Prof. Federico Lega, Professor of Health Management at the University of Milan.